As important as brand name, extra features and protection are to picking the right ice chest, there is one factor that can affect your entire user experience just as much, and that is cooler size. You may be carrying light for a birthday party or night spent watching a football or basketball game at your friends, or you might be bringing a cooler that has enough drinks to satisfy every member of your kid’s soccer team or the company softball team. 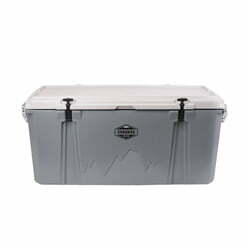 You might even need a cooler with enough room to store deer and fish meat from a hunting or fishing trip in the Rocky Mountains. Having the right sized cooler will affect how easy a time you have keeping your items in prime consuming condition and your guests satisfied. That’s where we come in. This in-depth cooler sizes guide provides a list of different sizes for ice chests and when they can come in handy. You might recognize some big names in the cooler field on this list, and that’s because they are prepared for any situation, while others are a little newer to the game and are looking to make a name for themselves. Either way, they have the sizes for a variety of scenarios, and you are among the lucky ones to get to discover these coolers today. Here we go. 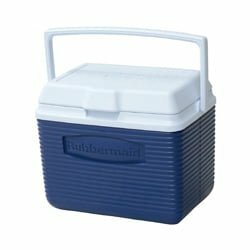 If you’re looking for the best 10 QT cooler that will give you the most value for its size, then we recommend the Rubbermaid 10QT Cooler, which can hold up to six cans plus ice, making it perfect for when you need something to hold your lunch at work or only need to bring a few drinks or snacks to a friend’s house. The food and drinks inside will stay cold thanks to the ice chest’s thermal retention, and the liner is designed to be easy to clean. You’ll have two colors to choose from, blue and red, and the cooler has an easy time avoiding stains and odors. This option is also made in the United States, which should satisfy anyone who wants to support more American-made products. TIP: You’ll find more coverage on Rubbermaid Coolers in our earlier post. If you’d like to know what the editor believes is the best option, then that would be Igloo’s Playmate Cooler Family (with Industrial Diamond Plate Exterior Design in this case). Avoiding spills won’t be a problem here thanks to its patented tent shaped locking lid, which swings to both sides to open so that you don’t have any problems reaching for something specific. The grip is molded so that you can keep a good hold on the cooler in case it’s left in the rain during a soccer or football game for a while. A diamond plate covers the outside of the ice chest so that it stays scratch and dent-free. TIP: Igloo offers more sizes and features across their Playmate product range – check out our very own Igloo Playmate review for more details. Performance is obviously a major factor when deciding which ice chest will make the most of your time, and in this case, Stanley’s Adventure Cooler 16 is the primary subject. Double wall foam insulation keeps your ice cold for days, ensuring that your drinks and food stay in prime consuming condition for the whole camping trip. It has enough room for 21 cans, which should keep everyone in your group satisfied, and you’ll have four color options to choose from in case you want your ice chest to stand out from the rest and not get confused with them: blue, red, polar white and the classic green. 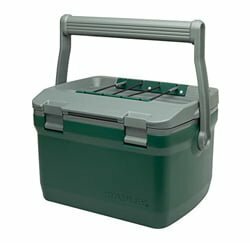 TIP: For a detailed review of the Stanley Adventure Cooler, click here. 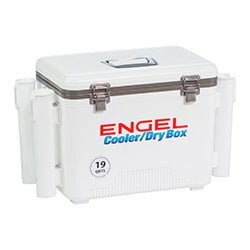 The Engel USA 19QT Cooler/DryBox takes the cake when it comes to what the editor prioritizes among others in this range. This ice chest operates more as a dry box that holds ice for certain occasions, so using it for drinks or food to bring to a party may not be the best idea. You’ll be given several options when it comes to colors, which include white, tan, grassland, and some of them have four rod holders for extra containment. You’ll have a variety of occasions to choose from when it comes to using this option, which includes sports, fitness, hunting, fishing, camping and other physical activities. TIP: In case you’re interested in Engel, we have more posts focusing on this brand’s products, here and here. 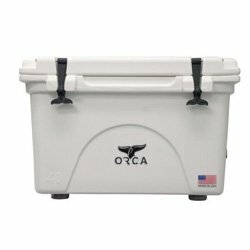 When it comes to which cooler does its job the best in this size range, we recommend getting your hands on the Outdoor Recreational Company of America’s 20 (ORCA) cooler with the lid and bottom. This option is more fitting for outdoorsmen who have a hunting and fishing trip coming up and want to spend the night star gazing by the campfire. 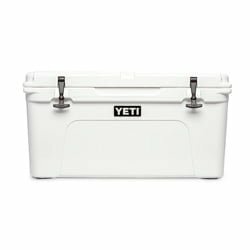 You’ll be able to put up to 24 cans in this ice chest, which should satisfy everyone in your group for the whole trip if they bring some drinks as well, and you’ll have a long list of colors to choose from, including most popular like white, tan, green, pink and so on. TIP: Don’t forget to check out our Orca vs Yeti post for more information. Igloo can’t help but take up spots on this list due to its ability to provide great-performing coolers, this time with its Marine Ultra cooler (28qt). 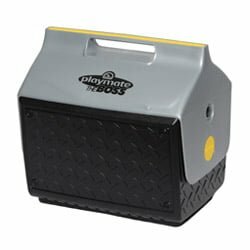 This option comes in large sizes, as well, but its smaller offering has the best value here, and the features come in abundance, such as cup holders that can drain themselves, tie-down loops for extra security, and ally wheels with a handle to make moving the ice chest a piece of cake. The ultraviolet inhibitors keep the sun from damaging the outside of the cooler, and the retention will keep your drinks and food cold for days. TIP: For more information on Igloo Coolers, we recommend you read this post. The option that comes in first place in the medium size range when it comes to performance is another ice chest that we previously discussed: the Orca 40 cooler. With this premium choice, you’ll be able to enjoy accessories that make you feel like you’re cooking in your kitchen while in the outdoors, and other features include a lid gasket to keep cold air sealed and grip handles that make the carrying process comfortable. Your ice will stay cold for up to 10 days, making this cooler perfect for long outdoor vacations, and the cargo net attachment lets you add extra items inside. The Orca 40 can be purchased in four main variations: Classic, Lifestyle, Camo and NFL. Each of these offers plenty of color options to choose from. Check them all here on Amazon. When it comes to what the editor thinks will give you the best bang for your buck in this range, that honor goes to another popular ice brand: RTIC and its mid-size cooler RTIC 45. This company’s hard cooler will not only keep your food and drinks cold for longer than most alternatives, but it is also designed to withstand the worst that nature has to offer, whether it’s nature, rocks or animals, and keep dents and scratches away. If you got a fishing or hunting trip coming up for small game, or if you plan to go tailgating with your friends and family for the next home football game, then get your hands on this option as soon as possible. 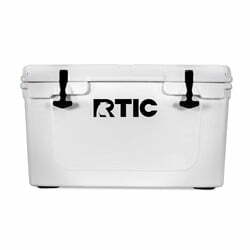 RTIC cooler is available in five color options: white, tan, blue, seafoam green and fabulous pink. 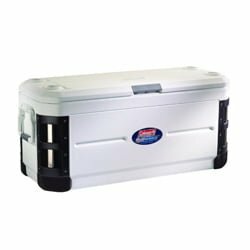 TIP: In case you’re looking for more information, our very own and hugely popular RTIC cooler review will provide you with the further details on both the RTIC’s brand and their main ice chest. Coleman, another ice chest brand that has been making a name for itself, has made its way onto this list, particularly in the category of best value. 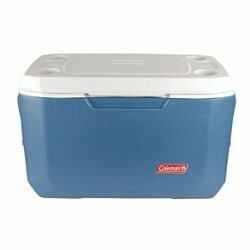 This Coleman 48 Quart cooler is able to keep your drinks and food as cold as possible when it’s as hot as 90 °F. The lid is hinged to make getting your items an easy experience, two-way handles are included to make the ice chest easy to carry, and the drain is leak-resistant so that you don’t have to hold the cooler upside down to get rid of excess water. You’ll be able to hold up to 63 cans in this option, and color options include white, blue, red and green. 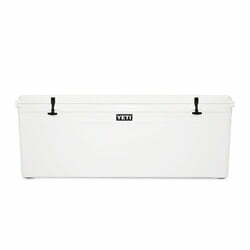 Those who value the editor’s opinion above everything else when it comes to big coolers will want to stick with Yeti’s Tundra 65 for their next backyard party or party by the lake. 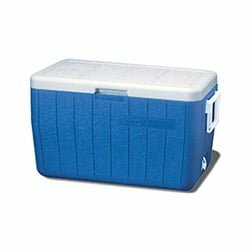 This cooler has a rotomolded construction to keep everything inside safe and secure while the outside stays free of dents and scratches. 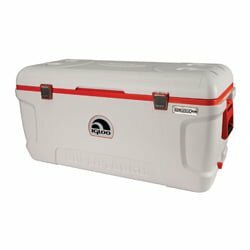 The drinks and food that you keep inside will stay cold for at least a week, a capability that has received plenty of praise from users, and you’ll be able to choose from white, desert tan and ice blue so that your ice chest doesn’t get confused with any others that are brought to the party. 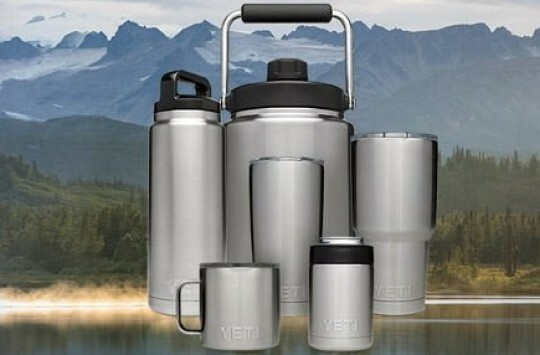 TIP: Here’s more information on Yeti coolers, with reviews, facts and purchasing options. Just when you thought you weren’t going to see Coleman on this list anymore, it pops up again, this time in the large cooler category. This is thanks to its Xtreme Cooler 70QT, which can hold up to 100 cans, making it perfect for a tailgating party outside a football stadium and friends and family, or even parties at other spots, including a friend’s house or a campsite. Its Have-A-Seat lid can support anyone weighing up to 250 pounds in case all of the seats and benches around are occupied, and the Xtreme 5 Technology keeps your drinks cold for up to five days in temperatures as hot as 90 °F. It comes in in two color options: Black/Gray and Light Blue/White. TIP: Here’s our very own Coleman Xtreme cooler review for your reading pleasure. 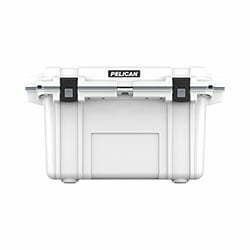 Pelican has the honor of taking the spot for best performance in the large cooler category with its Elite 70QT ice chest. Rotomolded polyurethane insulation keeps whatever you have inside cold for up to 10 days, which can come in handy for a long vacation with friends and family in any location. Molded handles make this ice chest easy to carry, and the tie-down slots allow you to use straps to ensure extra security. The list of colors that you’ll have to choose from is a long one, including white/gray, brown/tan, green/tan, grey/green, grey/white, tan/orange and seafoam. This option is made in the United States, in case you want to support more American-made products. TIP: Pelican coolers are one of the best coolers on the market, find out why in this post. Once again, Coleman has taken a spot on this list, this time in the extra large ice chest area with its 100QT Xtreme 5 Wheeled cooler, marked as the best value for the money. This one comes with wheels to make it easy moving this ice chest due to its size, and the two-way handles help out with the weight. Four cup holders are on top of the lid so you have somewhere to put your drinks when you sit down, and the ThermOZONE Insulation is void of any chemicals harmful to the ozone. Your drinks will stay cold for up to five days, even when its 90 °F, and no one at your party will go thirsty, as this ice chest can hold up to 160 cans. When it comes to best performance for very big ice chests, Cordova has it in the bag with its 125 (120 cans) rotomolded ice chest. Owners of this cooler get to enjoy five days of cold drinks and food thanks to its superior insulation, and it manages to be extremely light for a cooler of its size. 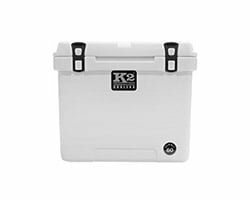 The lid locking system ensures that people only get into this cooler when you want them to, and the aluminum molded handles ensure that you have a strong grip and easy time carrying it. The feet on the cooler also keep it from sliding when it’s been raining, which also keeps people from having their feet knocked out from under them. TIP: Here’s our Cordova Cooler review, in case you need more first-hand information. Here comes the Igloo, again. This brand scored took multiple spots on our list and this time it’s with their Super Tough STX cooler which becomes the editor’s choice as the best 150qt cooler. Four cup holders are on the lid so that you have somewhere to put your drinks when the tables and counters are occupied. Your drinks and food will be able to stay cold for up to a week in temperatures as hot as 90 °F, and the stainless steel lid straps keep everything inside safe and sound. The grip handles on the side are designed to give you a good grip while carrying the ice chest, and it doesn’t weigh too much for a member of the extra large cooler category. Coleman can’t help but take up spots on this list, this time with its 200 qt H20 Marine cooler for the giant ice chests. This option is best for people looking to do some camping, and it is made of materials that keep it tough enough to handle whatever nature can throw at it. The handles on the sides make it easy to carry, whether on your own with a light load or with a friend when you’re carrying a large number of drinks for a party. 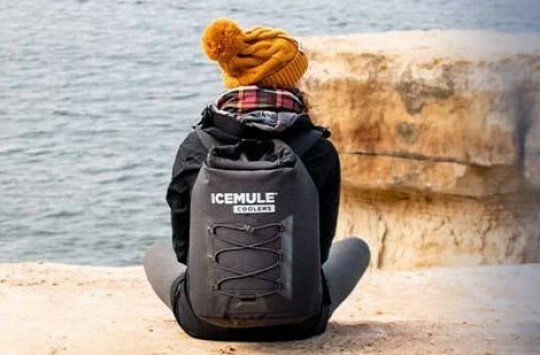 The drinks will stay cold enough to keep everyone satisfied for a weekend vacation, and the straps will keep the lid secure so that no person, or animal, can get in. Looking at its huge size, capacity and price, we can surely say this cooler is really the best value for the money in this size category. 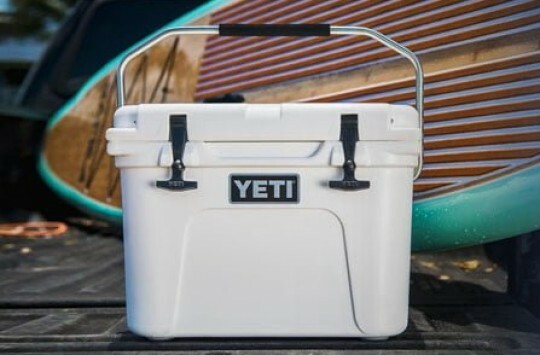 Yeti, which stands above the rest in terms of name recognition, takes another spot on this list thanks to the editor’s opinion, this time with its Tundra 250 ice chest. This option comes in handy when you want to hunt some deer, elk, moose and other big game, and whatever you catch will stay cold for the whole vacation thanks to the freezer-style gasket, something that users have praised online. The outside is designed to keep bears and other large animals from trying to get inside and leave dents and scratches to see when they leave, as well as any rain, hail and debris that nature will throw your way. TIP: Guess what? Tundra 250 isn’t the largest Yeti ou there! If you still need a bigger one, there’s the Tundra 350 which you may want to check out. When it comes to performance in the giant ice chest category, Grizzly is able to fill the plate with its 400 QT cooler. This option beats all others on this list in terms of what it can carry, as it can hold up to 500 cans, so you don’t have to worry about running out of drinks at a huge party. Like several other coolers on this list, this one will satisfy supporters of American-made products by being made completely in the United States. It can keep any bear from getting in and stealing your drinks and food while camping or hunting, and whatever you keep inside will stay cold for the whole trip. TIP: We’ve had much to say about these coolers. Check out our Grizzly cooler review right here. When it comes to deciding what size is perfect for you when looking at which cooler is the best purchase, it’s best to consider the source of measurement for this product, which is a quart in this case. One quart is equivalent to one-fourth of a liquid gallon (0.946 liter, 32 ounces), in case you are used to measuring the amount that you drink from certain containers with the latter. This is usually because gallons are more suited for measuring how big a jug you’ll need for personal use, as opposed to coolers, which contain ice needed to keep drinks for groups of people in prime consuming condition. Several factors are needed to determine the measurements for cooler sizes, including thickness, shape, design and external size, and different brands have their own ways of figuring it out. Yeti manages to measure size by ranging height between 14 and 25 inches, 18 to 60 inches for long and 12 to 22 inches wide so that there is enough room for the game that you catch in the woods, therefore taking up some of the larger spots on this list. For Coleman, the measurements are much smaller than those for Yeti, though they are still large enough to take up the medium and big categories. 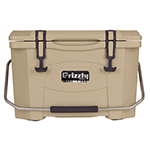 Grizzly has a wider range when it comes to measuring its coolers, with options ranging from 15 QT, which fit in the small section of this list, and 400 QT, which takes up the biggest of the big. Igloo also has a large size range, which is big enough to where it has ice chests that are small enough to carry with one hand and even wear like a backpack. The insides and the outside of all of the ice chests from these brands, including others from the list, determine not only how much you can fit inside for the party, but also how thick the outside needs to be in order to keep them safe from the weather and animals. How Many Cans Of Beer Can I Put In? Due to the large list of coolers that we have here, the amount of drinks that you plan to bring with you to any occasion will determine which one you pick. There are options that carry as little as six cans, such as the Rubbermaid ice chest, and Stanley’s Adventure cooler doesn’t contain much more at only 21. Coleman and similar brands, however, have options that can hold much more, particularly in the 100-200 range in case you’re worried that people will go thirsty at your get-together. With Grizzly 400 QT, no one at your occasion will ever be in this situation, as it has coolers that can hold up to 500 cans. The size for the cooler that is best for you depends on what exactly you need an ice chest for. With Rubbermaid and Stanley’s Adventure coolers, you can pack a couple of six packs of beer in case you and your friends agreed on you being the one that’s bringing the drinks. 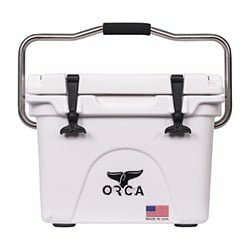 The ORCA is designed so that you have enough room for ice to keep a couple of six packs cold for a whole weekend. Coleman is perfect if you need to bring at least 60 cans to whatever you’re attending, as well as if you need a cooler that is slightly tougher than the average one if you’re going to end up putting it on a boat or on a log by the campfire. When it comes to needing at least a couple hundred of cans and plenty of ice to keep drinks and food drink for at least a week, than Igloo and Yeti are your best options. Mini and personal coolers are best suited for work and school when you need something to hold your lunch, or if you’re going on a short hike and need something to hold your water and protein bars, while small coolers could work for this occasions but are best used for bringing beer, soda, food and other items to a friend’s house for a party, whether it’s for a birthday or graduation celebration or just watching a basketball or soccer game. When it comes to medium coolers, you will be satisfied for when you want to have a picnic with your loved one or whole family. Large coolers is where we start seeing more cases, as some options in this area are big enough to need handles and wheels to carry, which is suited for parties not only at a house, but also at a beach or campsite. Extra large and giant coolers also work for these cases, as well as for when you plan on fishing or hunting big and medium-sized animals that need something with a lot of space and plenty of ice to be stored for maintaining its prime condition. 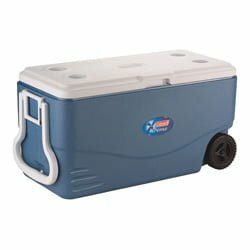 What is the best cooler size for a family of four? If you have a family of four and can’t decide which ice chest will work for your time together, we recommend sticking with medium-sized coolers. Ice chests of this size work for small groups rather than large ones because they have enough to store a few packs of drinks in addition to food, ice and other items that you might need. 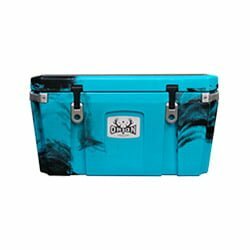 Whether you’re going on a picnic in the park to enjoy the sun with your wife/husband and children, or you want to go to a campsite in case you end up meeting up with some friends or make some new ones, medium coolers will make sure that you don’t have to carry too much, but enough to ensure that no one in the family goes hungry or thirsty and has to buy an extra drink or snack from a nearby vending machine. If you’re on the budget, we’d recommend you check RTIC 45 and Yeti 65 here or Coleman Xtreme 70. 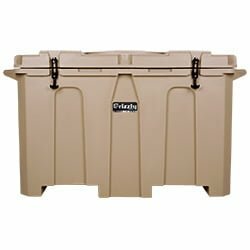 What is the best cooler size for deer? You’re going to have to fork over a few extra bucks for getting an ice chest for your hunting trips, as you will need a giant-sized cooler to hold the deer meat that you catch on your trip. Plenty of ice will be needed to keep the meat cold so that you will be able to eat it later on, and the largest of coolers have the retention necessary to keep items inside cold for 10 days, which is perfect for this occasion. The size of the deer also requires that you have a very large ice chest. If you tried using a smaller cooler, you would need a bunch of them and have to cut the deer meat up into several pieces to fit in all of them, which would consume a lot of time and would waste the meat that you could have used for dinner, thus wasting the whole trip. We recommend here Yeti Tundra 250 or 350, or even Grizzly 400 if you’re serious about catching some big game. What cooler sizes work for trips to Disney World? If you have a trip to Disney World coming up and want to figure out how big of a cooler you should bring to stay hydrated for the whole day, then you’ll be happy to know that we have the answer. Smaller coolers work best for this occasion, as the size limit for Disney World is 24 in. X 15 in. 18 in. at the biggest, making soft-sided coolers and water jug coolers the best options at this vacation spot, especially if you don’t want to get tired from carrying a cooler around, as vacation spots like this can be exhausting despite how fun they are. However, what you’re allowed to bring also affects the size of the cooler you can bring, as Disney doesn’t allow anyone to bring beer or glass containers, which are often found in the larger options on our list. Food and drinks like water, soda and Gatorade, as well as baby food jars, the one exception to the glass rule, will work, so it would be smart use the same cooler that you would normally use to hold your lunch. 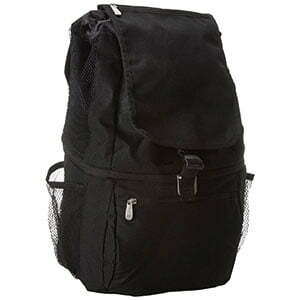 Here we recommend Yeti Hopper Flip 12, Polar Bear Soft or AO Canvas Soft Cooler. What is the biggest cooler available? In case you were wondering what the biggest cooler you can get online is, it is actually none of the ones we have listed above. That honor goes to the Icey-Tek 600 QT Long Box cooler, which, as the name suggests, can hold up to 600 quarts of ice, which is much more than the options we mentioned earlier. Like Yeti and Grizzly’s offerings, Icey-Tek’s is perfect for outdoorsmen who need something to put their game in, whether it’s for a fishing trip or hunting some deer or elk. It matches up with Yeti’s biggest Tundra offerings, both in how much storage room it has and how much it will cost, and its ability to keep items inside cold for a long period of time makes it very much worth it. 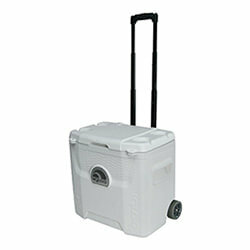 TOP 3 Biggest Coolers we’ve found are: Icey-Tek 600 QT (check availability), Grizzly 400 QT and Yeti Tundra 350. What cooler size are you used to? Are you new to the cooler game and have a certain size in mind for what you want to get, or do you plan on buying a differently sized ice chest because you’ve started going to different get-togethers and need one to fit the occasion? Share your answers about the options above in our quick survey here. Cooler size is a major factor when deciding what to get for either your first ice chest or a new one for a different occasion. The occasion plays a big part in your choice, as the sizes we listed are fit from anything from a lunch at work to a hunting trip in the mountains. Keep these options in mind, as well as the situations where they work, for when you make your choice. Feel free to comment on this post below and share your thoughts and experiences with owning a cooler, its size, and what situations it has worked for. We look forward to hearing your stories, as well as any words of wisdom you have to offer for anyone who is looking for their first cooler or one of a different size.